After three years in the making, the highly anticipated award winning third installment of the Infamous series was finally released Friday March 21, 2014. Developed by Sucker Punch Studios, and released by Sony Computer Entertainment for the PlayStation 4 Video Game Console. 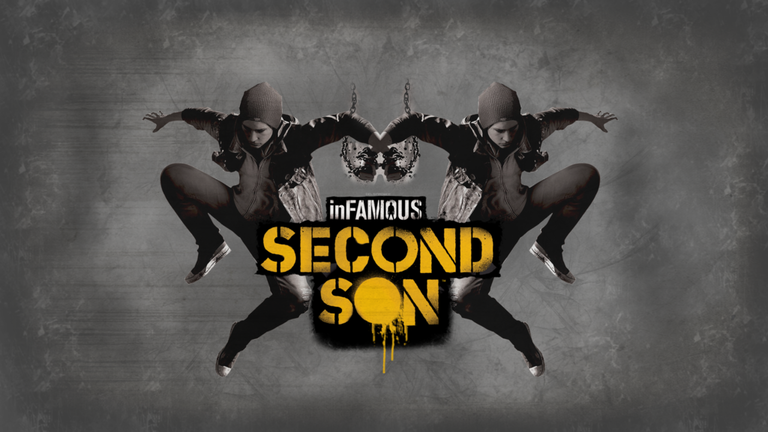 You begin the game as Delsin Rowe, a delinquent from Salmon Bay, Seattle, Washington, a member of an Akomish Tribe. The story takes place in 2013, seven years after the story of Infamous 2. You start off in the Akomish settlement in Salmon Bay, a few miles just outside of Seattle, Washington. You begin the game by tagging a billboard which contains a Sheriff advertisement of Reginald (Reggie) Rowe, Delsins older brother. As the Sheriff, who saw the billboard no doubt, tries to find Delsin, you run to the "Longhouse" a local gathering place. As you reach the Longhouse, the Sheriff is just leaving, and confronts you at the front door, as this occurs a truck crashes nearby. The truck contains three conduits, two of which escape almost right away, the third is trapped by the truck. Reggie, being the good sheriff, goes after the two escaping, as that occurs Delsin assists the third conduit, Hank, from the wreckage of the truck. While the sheriff returns after losing the other two conduits, Hank takes Delsin hostage, in the struggle Delsin gains smoke powers, and passes out. He awakens to find he has powers he can barely control, and that suddenly everyone is in danger because of Hank. As you confront Hank, you start to gain control over your powers, until finally you chase him out into the open where the D.U.P. is located. Augustine, the leader of the D.U.P. then questions you by means of torture, sending shards of concrete into your legs, forcing you to pass out. Delsin then awakens to find a lot of his tribe had been tortured for more information as he had, none of them gave up any information. Unfortunately Delsin finds out, they are all dying because of the shards of concrete, still working it's way into their legs little by little. So, Delsin and his brother head to seattle, where the fun really begins, and the story just launches into the air from here. The graphics of the game, is of some of the highest resolution I have seen to date, if you zoom in enough you can see pores on Delsins face. When the characters speak, their mouths are actually in sync with their voices, and you can actually see emotion on their faces. The world is very detailed as well, looking at the picture above you can see the entire city in great detail. That isn't some kind of picture that's loaded into the background to make it look like you can see it. There are actual shades, and layers of graphics all on top of one another. 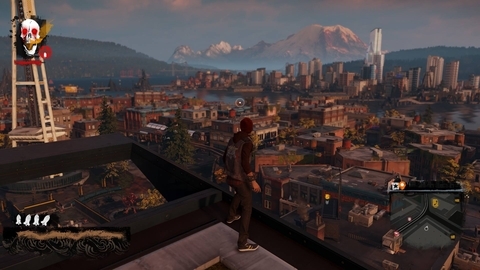 Excluding the forests, mountains, and the water, you can go anywhere in that city, even the top of the space needle can be reached.They may have accomplished this in other games, however this quality of high definition detail was not very possible before. There's almost no lag with this game what so ever, even in the most demanding graphical moments, no lag. When I beat the game, I had played on normal to get the feel of the story line, and to play as a morally heroic character. I found that the game could be challenging and difficult at times, but have some interesting, or even amusing rewards. To gain advantage of the city, you can do morally good, or evil actions, which will help you gain control of the city for the citizens, one district at a time. You can be good or evil, on my second run I found myself playing evil on expert difficulty. Now playing both sides of morality, I've found they've made being evil a bit easy, taking the easy road, with a very sad reward. Loneliness. However gaining your powers is easier, because killing everyone contributes to your evil evolution. While there's very few morally good actions for you to perform, there's an unlimited amount of evil actions you can perform. So, whether you wish to be good, evil, or both, Infamous: Second Son can certainly help with that. It's a visually stunning game, with an interestingly lovely story line, that can tug on the heartstrings whichever direction you tug.